Albania- exclusive vacations with low prices. Bright Side is an online publisher who writes about inspirations, creativity and destinations. 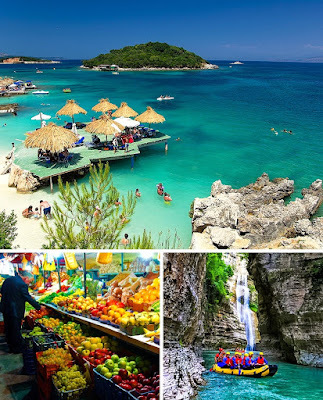 Recently they published an article ranking 12 Magnificent Countries That Offer Rather Cheap Vacation, and among them is Albania. Brightside recommends their readers to have a look at Albania as a magnificent country with low prices: “Albania is full of magical places: Gjirokaster City, the Blue Eye, Lake Skadar, Ksamil, Butrinti, and more. It’s easy to find cozy rooms in hostels from €5 and from €10 in hotels and in private houses. Albanian prices on food and alcohol are some of the lowest in Europe. Street food is also very tasty and costs from €1.80. Restaurant prices are rather cheap too, usually from €3.50. The most popular dishes are: Chomlek with meat and vegetables, seafood dishes, oshaf desserts, and tasty coffee from €0.50-€1. You can also count transport expenses: €0.90 for 31 miles (50 km) if you travel by train and €0.90 for 19 miles (30 km) if you travel by bus.